Hello! Remember last week I was telling you about how some of our people remembered their Christmases in the years past? Let me tell you a little more today. I wondered how Christmas was celebrated out Indian Gap way, so I called Lester Roberts who spent most of his boyhood days out there. He reported that their celebrations were very similar to other communities. The school would have one of the best cedar trees that they could find and have it all dressed up with popcorn garlands and candles. There would be the program given to a room full of proud and gloating parents. Now the recitation given by some timid little boy might have been so low one could hardly hear it, and some girl would come out, stand as stiff as a poker and speak so fast you couldn’t get all the words, yet it was a “real good” program. Lester’s fondest memories were centered on the home. As a youngster they would hang their stockings on the foot of the bed. There was the thrill of jumping out of bed and exploring the gifts, fruit and candy that were in the stocking. As the boys grew taller and their stocking got shorter, Mrs. Roberts would always have a little box of presents beside the bed on Christmas morning for each one as long as they were at home. Lester told of the first year that he had gone off to college. They had driven late Christmas Eve night from Texas Tech. It was real cold so he jumped right into bed. When he awoke the next morning and looked beside the bed there was not the usual Christmas box, and he couldn’t keep from having a small feeling of disappointment. He then realized he was not a littler boy any more. The Christmas season has always meant much to the German people and the Lutheran Church. To get some memories of their Christmases, I talked to Martin Schrank and Mrs. Ermin Bottlinger. Mrs. Bottlinger remembers when they would have three days of celebration and worship at the church. The Christmas tree program would always be held on Christmas Eve night. There would be the program given by the children. The little girls all dressed up in their nicest dresses with braided pigtails crowning their heads. The boys would be in their knee length knickers, often straight legged and supported by colorful suspenders. And the boys often wore bow ties. There was also group singing, and of course it always included Stille Nacht, which we know as Silent Night. This favorite of all favorite carols is one of the many contributions the German people have given to our world of music. After the program and gifts and bags of fruit and candy had been given to everyone, families would return home to find that Santa had visited their home and had left toys and goodies for all the good little boys and girls. There would be services at the church on Christmas Day and then again on the following day. All these services at the Aleman Lutheran Church were held in the German language, and continued that way until World War II. Even now the Fifth Sunday services are conducted in that language. The Christmas Day dinner was an occasion much as most of us have, except on the big platter on the table would be a goose rather than a turkey, the turkey having served his purpose back at the Thanksgiving dinner. The goose would be so rich and fat that many other foods would have to be eaten to tone it down. One of these dished would be sweet potatoes prepared in some way. May your memories of Christmas be very happy ones, but may this one this year be one of your brightest ones. Last week, November 19th, Hico, Texas said farewell to hometown hero lance corporal Shawn P. Hefner. He died Nov. 13 while supporting combat operations in Helmand province, Afghanistan. 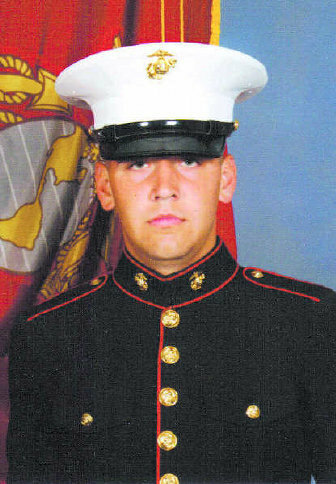 He scheduled to return to his home base at Camp Lejeune, N.C., within a week. Hefner who was a 2006 graduate of Hico High School enlisted in the Marines in 2008. Heffener’s flagged draped coffin was returned to Waco, TX on Thursday November 19th, The Patriot Guard Riders of North and Central Texas led the procession Waco to Hico. As the procession wound its way along Texas 6 through Valley Mills, Clifton, Meridian and Iredell citizens lined the highway many waving American flags as a sign of respect. The entire town of Hico, all 1300, lined the streets to welcome home their hero. According to the Ft. Worth Star-Telegram Hico School Superintendent Rod Townsend even had all of the students from 3rd through 12th grades bused downtown. This video tribute by USFallen.org shows the return of a fallen hero LCpl Shawn P. Hefner. It is about 10 minutes long but worth the time to watch. Update: The Stephenville Empire-Tribune posted a video of the actual procession entering Hico. There will be a business meeting and a memorial service at the Murphree Cemetery on Sunday, April 26 at 2 p.m. Yearly dues are $6 per grave or empty space. For more information about dues and memorial or endowment contributions leave a comment. Harold Blair beside the patch machine. Originally published in the Hamilton-Herald News 19 March 2009. Harold Blair has reopened his boot and shoe repair shop. Harold Blair is back in business. At 90s something, he has reopened Blair’s Boot and Shoe Repair. Verne Crain, who opened in January 1954. Crain was the father of E. C. Weathers of Hamilton, who provided a history of her father’s shop. By January 1954, Robert Verne Crain was ready to launch out on his own in the shoe, saddle and combine canvas repair business, she wrote. “Within a 24-hour period, Mother, Daddy and I drove to Celina, purchased a shoe repair shop, loaded it on Bill Stephens’ truck and returned to Hamilton. Crain’s Western Shop opened at 205 N. Bell, which in 1954 was the north end of the building now occupied by Floral Designs by Jill. Within a few years, the front part of that building became available, and Verne, with the help of his older brother, Edwin, rolled the shoe repair equipment on iron pipes up the street to 123 E. Henry St., which was its location when the city flooded on April 26, 1957. On that day, Pecan Creek went on a rampage, causing an estimated half-million dollars in damage to the city’s business district. The square was submerged in water, and many stores on the north and east sides of the square had serious damage. The City Drug building had three feet of water inside when its back door disintegrated. Several cars from Paul Gilliam’s Used Car lot on North Rice were washed away. Gerald’s Feed Store, which had folding doors across the front and back, flooded throughout, damaging almost all of their inventory. we spent the evening in the darkened first floor parlor of our dorm”, Weathers wrote. “Occasionally when electricity came on, we heard about floods throughout Central Texas.” Weathers said she wasn’t concerned when news was broadcast about floods in Hamilton, because she was sure that her parents were either at their farm at Blue Ridge or at the home on West Grogan Street. But they were not. They rode out the storm from their shop. “I will never know why Daddy had sandbags in his shop, but he did,” Weathers wrote. The Crains sandbagged the front door, which was slanted across the southeast corner of the building, reducing the force of the water and preventing their building from being flooded. Mrs. Jewel Workman Hughes Parrish purchased the building in 1958, and the Crains moved their shop across the street to 210 N. Bell, a building that had only a dirt floor, and later to 206 N. Bell, its final location. Illness caused Verne to close the store in 1974, but Ray Weathers, Elreeta’s husband, reopened in 1975 and operated the business for 10 more years. He sold all of the shoe repair equipment, supplies and furniture to Blair in 1986. Blair will be open 9 a.m. to noon and 2-6 p.m. on Mondays, Wednesdays and Fridays. An historical marker will be unveiled and dedicated on Sunday, April 19, at 2 p.m. at the home built by Col. George R. Freeman on the corner of Main and College streets–immediately west of St. Mary’s Episcopal Church in Hamilton. The marker will commemorate the builder of the house, Col. George R. Freeman (1830-1910), who was a Confederate officer during the Civil War. The Texas Historical Commission places historical markers and designations as tools to be used to interpret, promote and protect historic and cultural resources that are worthy of preservation. On June 11, 1865, in Austin, Col. Freeman interrupted the robbery of the Texas State Treasury preventing bankruptcy of Texas.